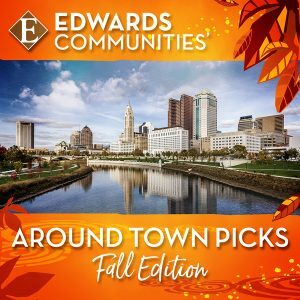 November brings the holiday season to Columbus Ohio, and the city has lots of fun activities taking place this month! So whether you live in Columbus, are visiting relatives, or are here on business, we hope you can get out and enjoy all the festivals, sporting events and musical performances our city has to offer! The Buckeyes will conclude their regular season this month with home games against Nebraska on November 3 and the team up north on November 24; and away games at Michigan State on November 10 and Maryland on November 17. If the Bucks play away or you can’t snag tickets to a home game, there are plenty of places to tailgate in Columbus and cheer our Buckeyes to a win, including Edwards’ private club, The Barn! Go Bucks! Hockey season has begun and our Columbus Blue Jackets have home games scheduled this month against the Dallas Stars, New York Rangers, Florida Panthers, Toronto Maple Leafs, and Minnesota Wild. Get ticket information on their website. This wildly popular tribute to sci-fi and B-grade horror movies will entertain you with vibrant songs, dance, and an interactive experience you won’t forget. Based on the movie starring Reese Witherspoon, Legally Blonde puts a musical spin on a California sorority girl who remains true to herself while shaking up the stereotypes of Harvard Law School. Learn more and get your tickets here. This hometown holiday run offers something for everyone — a 5-mile run, 2-mile walk and 100-yard dash all to support Easterseals and their early intervention program. Participants in the five and two mile race will receive a pumpkin pie, finisher’s medal, and a ¾ zip, long-sleeve technical shirt with the race logo. Dave Matthews Band will begin their 10-city tour right here in Columbus, singing a wide range of songs from their long and successful music career! They will also perform songs from their new album, Come Tomorrow. These are just a few of the fun events offered in November in our exciting city! You can learn about other events by visiting local websites such as Experience Columbus and Columbus Underground.